There are a lot of well-known tourist places in San Francisco from Golden Gate Bridge to Ghirardelli Square which are amazing but crowded. I want to use this blog post to talk about some other places with lesser crowd that I as a local have explored and loved. Skip the over-hyped ferry to Alcatraz and go to Angel Island instead. Beautiful panoramas, lesser crowd and well-maintained trails is what you'll get here. To get to Angel Island, you need to take a ferry from San Francisco or Tiburon. We took the first ferry out from San Francisco, and arrived at Angel Island after a windy ride on the bay. Angel Island offers hiking and biking trails, and we hiked the Perimeter Trail, which as the name describes, is a five mile loop across the island. Stopping at various points-of-interest including the Immigration Station and Quarry Beach, we saw some gorgeous views of the bay all along the trail (Sausalito, Golden Gate Bridge, the City and Bay Bridge). Be prepared to spot some vultures and wild pigs on this island. After finishing our hike around noon, we ate our lunch and relaxed watching the birds and boats. There's ample space to engage in an activity like playing volleyball or frisbee. After relaxing for a while, we took the ferry back to the city and were home by early evening. It's a perfect way to spend a summer day away from the crowds. The ferry to Angel Island is also around $10 lesser than the ferry to Alcatraz, so more reason why Angel Island is a better choice. If you are into camping, Angel Island also has camping spots for over-night stays on the island. It is impossible to snag a camping spot over a summer weekend, so your best bet would be a winter weekend or a week day. If you're not already aware, cars are not allowed inside Golden Gate Park every Sunday the whole year. Cars are also blocked on Saturday in summer (from April to September). This means pedestrians and bicyclists get to use the whole road inside the park. If you don't own a bike, you can rent it at one of the many locations surrounding the park. While the small hills inside the park may be strenuous while you bike, the experience of having the wind run through your hair as you speed down-hill on the bike is worth the strain. Not to be cheesy, but it's moments like these that make you feel alive. Although not outdoors, the most famous things-to-do here are visiting the Cal Academy of Sciences and De Young Museum. Both of them are great and worth the hype. You need the whole day to check them out. There's also the De Young Observation Tower which offers 360-degree panoramic perspectives of the city for free. There are other places in the park which don't need the whole day like Japanese Tea Garden or Conservatory or Flowers. These are good too, and you can spend between 2-4 hours exploring them. More attractions inside the park include Stow Lake, Spreckels Lake, Rose Garden, Dutch Windmills and Bison Paddock. One of my favorite things to do in the city is to bike down to Golden Gate Park and spend the day exploring the park. There's no one way to plan your day here. We tend to laze around and relax near a lake. After spending the day at Golden Gate Park, we wander off to watch the sunset at Ocean Beach (works only if it's a clear day). 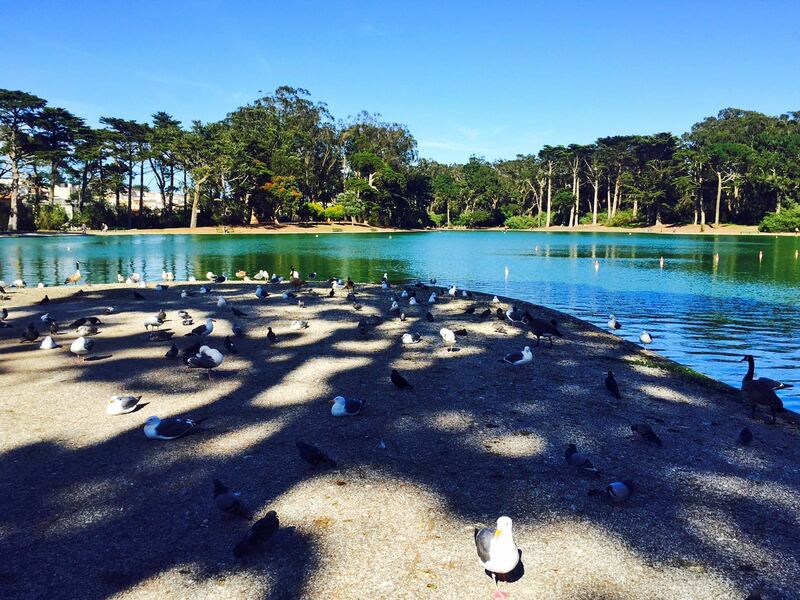 Golden Gate Park is a great way for a family to spend their entire day outdoors. Marin Headlands Trails are right next to Golden Gate Bridge and seem kind of hidden. Considering the traffic Golden Gate Bridge sees everyday, these trails are under explored. All these trails are in the Marin County and are part of the Golden Gate Recreation Area. 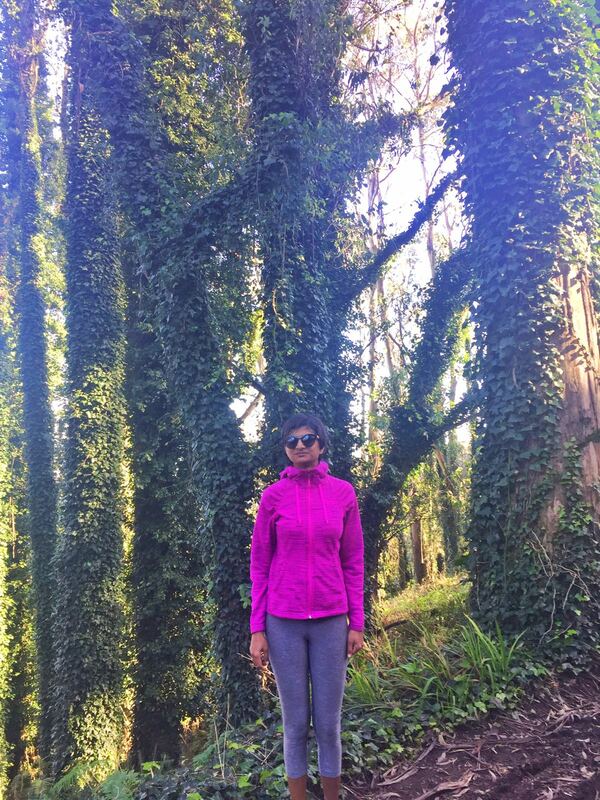 We explored the SCA-Bobcat trail in Marin Headlands earlier this year and enjoyed it. Despite it being a national holiday on the day we went, there were very few people on the trail and we got to see many beautiful sights of the bay. My favorite part about these trails is that they are minutes away from the city, so you can get a completely-immersed-in-nature kind of experience just few miles away from all the crowd. So, Lover's Lane is a part of the Presidio Trails in San Francisco. This easy trail (more of a stroll) located in between a eucalyptus grove is super pretty! For the best experience, visit Lover's Lane during sunrise or sunset and watch the sunlight come pouring in through the dense eucalyptus trees. The twisting path linking all the trees evokes a sense of calmness and serenity that you wouldn't think was possible. It isn't too hard to get this place all for yourself, there may be an occasional jogger or photo shoot, but I have never seen this place crowded. Because of it's serenity, it's famous for being a romantic spot - so do plan to visit with your partner :). Lover's Lane feels like a beautiful piece of art in the midst of a concrete jungle. It's easy to get lost in here listening to the birds chirp, leaves rustle and watching the occasional fox or coyote wander around. Slow your step down, and spend some time here. You'll not regret it. Coit Tower is a famous and crowded touristy spot, I'll admit that much. But Coit Tower Steps is not where I spot a lot of tourists. 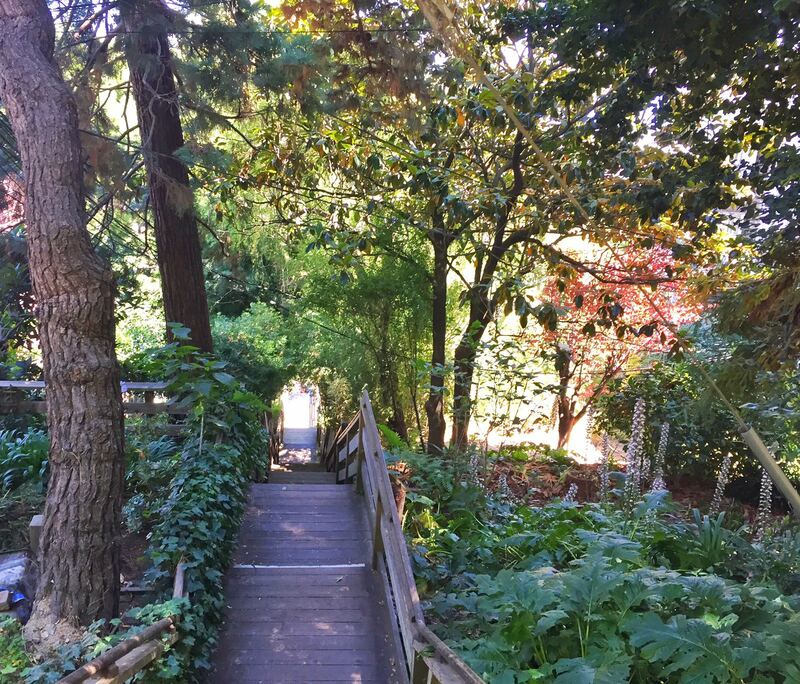 One of the entrances to Coit Tower is close to my work-place at Filbert Steps, so one of my favorite things-to-do during the middle of my work day is going up on these stairs. It's a small and strenuous walk, but the views of Bay Bridge and Embarcadero from here are worth the visit. It's not just the views either. There are little flower gardens en-route the way to the top, so it feels like a tiny slice of nature in the center of a bustling city. So, those are my favorite outdoor places that have lesser crowds. 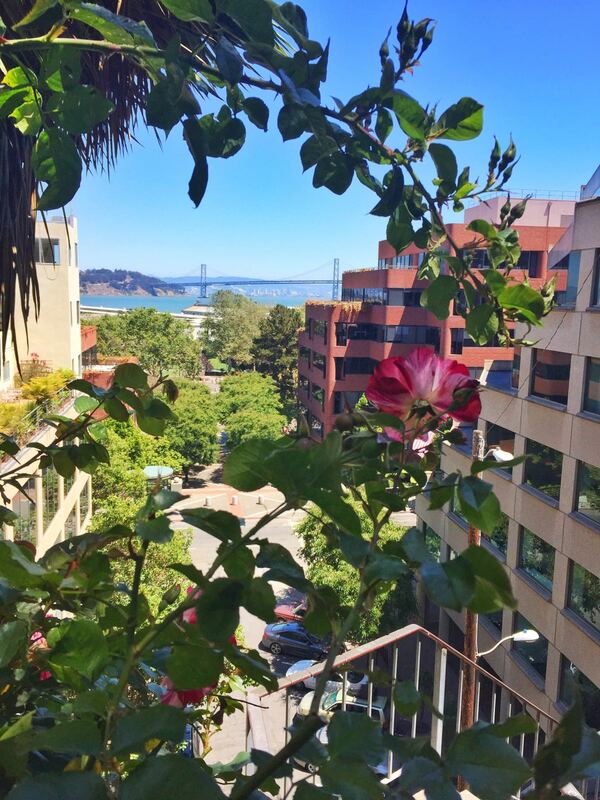 What are your top-picks in San Francisco or Bay Area? Do you prefer crowd-free places or do you enjoy being a part of the crowd?